Entities that perform work in the streets—from utilities or contractors accessing subsurface infrastructure to property owners repairing sidewalks—must follow certain procedures when undertaking such work and must meet restoration requirements following its completion. The way street work is executed impacts vehicular and pedestrian movement, the useful life of the street surface, and the experience of the street as a public space. 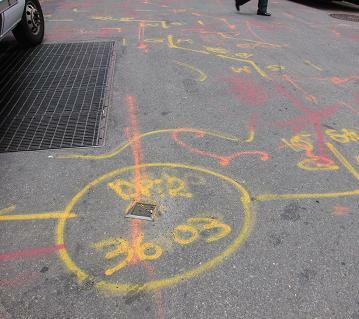 The New York City Department of Transportation (NYC DOT) has adopted specifications and regulations stipulating how street work must be performed in order to minimize disruption and maintain the integrity of the street surface. Street work at Third Avenue and Saint Marks Place, Manhattan as part of a larger Cooper Square area reconstruction project. This chapter describes the basic steps for performing work in the street, for restoring the street after work is performed, and for responding to each type of notice or request that may be issued during a Highway Inspection and Quality Assurance (HIQA) inspection. Call 911 to report a gas odor or a gas leak. 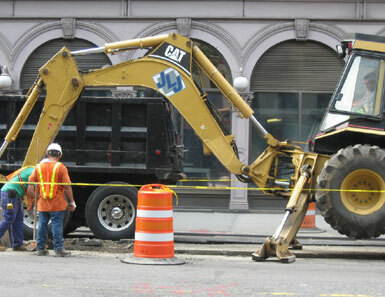 Permits— In order to perform work in the street, it is necessary to obtain a permit from NYC DOT. Permits are available for various types of work, including Street Opening Permits, Building Operations/Construction Activity Permits, and Sidewalk Construction Permits. The requested permit must be appropriate for the type of work that is planned. Typically, permits must be kept at the work site or designated field headquarters at all times and must be made available for inspection. Further information on permits is available in Chapter 3 Permits and Approvals. Insurance and Permit Bonds— After initial registration, active permittees must submit proof of all insurance and bonds annually. Further information on insurance and bonds is available in Chapter 3 Permits and Approvals and in Section 2-02(a) of the Highway Rules. 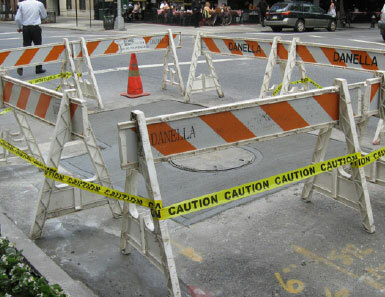 Work Site Safety— All obstructions on the street must be protected by barricades, fencing, railing with flags, lights, and/or signs placed at proper intervals and at prescribed hours in accordance with the most recent version of the Manual on Uniform Traffic Control Devices (MUTCD), published by the Federal Highway Administration, and the New York State Supplement. Further information is available in Section 2-02 (h) of the Highway Rules. Signage—Signs must be displayed at the work site or at 100-foot intervals along a series of excavations or continuous cuts indicating the name of the entity performing the work, the name of the entity for whom the work is being performed and, if applicable, the name(s) of the subcontractor(s). Signs must be conspicuously displayed and face the nearest curb line. They should be clear, readable and in letters at least 1" in height, and conform to all NYC DOT specifications. Further information is available in Section 2-02 (c) of Highway Rules. Restoration— Once work in the street has been completed, permittees are required to restore the street excavation to provide a smooth riding surface. Permittees are responsible for maintaining the restoration for the duration of the "Guarantee Period" and must retain insurance for this purpose. The Guarantee Period is considered to be three years on unprotected streets, and up to five years, but at no time less than three years, on protected (recently resurfaced or reconstructed) streets commencing on the restoration completion date. This is discussed in greater detail under Section 4.3 Street Restoration Requirements, and in the Sections 2-11(e)(15), 2-11(e)(16) and 2-11(f) of the Highway Rules. Inspections—All work performed in the street is subject to inspection by the HIQA unit. HIQA inspects work sites for compliance with Title 19 of the NYC Administrative Code, NYC DOT Rules and Regulations, NYC DOT specifications and NYC DOT permit stipulations. HIQA performs inspections during active construction. Existing Infrastructure—Permittees must not remove parking meters, traffic signs, street lights, street furniture, and similar items unless authorized on the permit. Unauthorized removal of muni-meters is prohibited. Give notice to New York 811*. In accordance with New York State Industrial Code Rule No. 53 relating to construction, for excavation and demolition operations at or near underground facilities, permittees must contact New York 811 at least 48 hours prior to beginning any work. New York 811 may be reached by calling 1-800-272-4480 or 811. Break the existing pavement using only hand-held tools (no "ram hoes" or truck-mounted tools), unless otherwise authorized. Assure that tools, debris, or other materials are not allowed to block water flow in gutters. Use timber, sheeting or bracing for any open excavation deeper than 5 feet. Not perform tunneling or jacking without a permit. Use full trenching for all sewer repair/connections. Limit traffic obstruction to one lane unless otherwise authorized by NYC DOT. Employ and display appropriate barricades, signs, lights, and other approved traffic control devices in accordance with the most recent version of the MUTCD, published by the Federal Highway Administration, and the New York State Supplement. Cover all unattended street openings/excavations with plates unless otherwise directed by NYC DOT. Follow all permit stipulations, such as the hours and/or days in which street operations and construction may take place, and removal of applied markings pursuant to a New York 811 notification at Special Treatment Project (STP) locations. Work on critical streets may be limited to nights, weekends, or off-peak periods; however, work outside of the weekday daytime period (7:00 AM to 6:00 PM) requires a noise variance from the NYC DOT Office of Construction Mitigation and Coordination (OCMC). Maintain at least 5 feet of unobstructed sidewalk for pedestrians at all times. Any work that narrows the sidewalk to less than 5 feet may require a temporary Sidewalk Closing Permit. Store construction materials in areas adjacent to the work site only as designated on the permit. Excavated material must either be removed from the site or stockpiled at a designated curb with proper barricading. Storage of construction-related equipment, excluding cranes, must follow any special stipulations on the permit. Storage of cranes, as noted in the Highway Rules, Section 2-05(j), requires an additional permit from NYC DOT. 4.2.1 New York 811, Inc. Call before you dig. 811 or 800-272-4480. Streets can hide a complex infrastructure of underground utilities. One call to New York 811 provides for where gas (yellow), electric (red) and phone (orange) are located. It is essential to call New York 811 before digging anywhere, including sidewalks and soil. 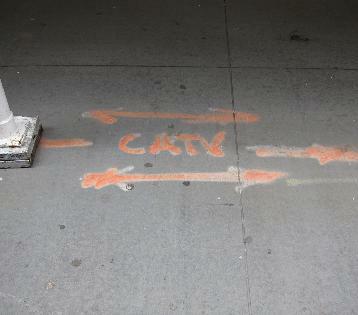 This New York 811 marking shows where a cable television line is located beneath the sidewalk. Street resurfacing in progress. 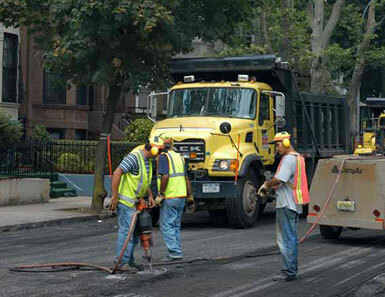 NYC DOT's street reconstruction and resurfacing programs include nearly 6,000 miles of city streets. "Backfill" refers to the bottom layer of the restoration. All materials used for backfill must be free from bricks, blocks, excavated pavement materials and/or organic material or other debris. "Base course" refers to the layer of material below the wearing course. The concrete base must be restored at the same grade as the existing base; at no time may it be brought up to the asphalt course unless authorized by NYC DOT. Wearing course* refers to the top layer of pavement, which is designed to provide an even surface and withstand the wear of traffic. 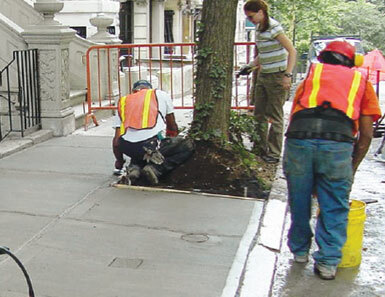 The wearing course material must conform to NYC DOT specifications, and the finished grade of the wearing course must be flush with the surrounding pavement on all sides of the cut. The restored wearing course must extend 6 inches beyond the edge of the base course. If plating or decking will be used, the size of the plate or decking must extend a minimum of 12 inches beyond the edge of the trench*, be firmly placed to prevent rocking, and be sufficiently ramped, covering all edges of the steel plates to provide a smooth riding surface. All plating and decking must be made safe for vehicles, cyclists and/or pedestrians and be adequate to carry the load. Street restoration following utility work, 18th Street and Irving Place, Manhattan. A temporary sidewalk closure while a sidewalk repair is underway. Expansion Joints— Expansion joints must be placed at 20-foot intervals, expansion joint filler material must be placed to the full depth of the sidewalk, and all expansion joints must be recessed and sealed. Concrete—must be poured and finished in accordance with NYC DOT Standard Highway Specifications. Sidewalk flags—Must be 5'x 5' where feasibleAll flags containing substantial defects as defined in the Highway Rules must be replaced; patching of individual flags is not permitted. Foundation Material—When replacing a concrete sidewalk, the foundation material may be retained and graded to the required subgrade. Any foundation material not meeting specifications must be removed. Sidewalk Grades—Unless granted a waiver from NYC DOT, permanent sidewalks must be laid to the legal curb grades. Transverse Slope—Sidewalks must be laid to pitch from the building line toward the curb. The minimum slope, calculated on a line perpendicular to the curb, must be 1" in 5', and the maximum is limited to 3" in 5'. Minimum slopes should be used wherever possible. The maximum transverse slope permitted for vault covers, gratings and other sidewalk structures is 1" in 5'. Longitudinal Slope—The longitudinal slope of the sidewalk must be uniform and parallel to the curb at the curb's proper grade. 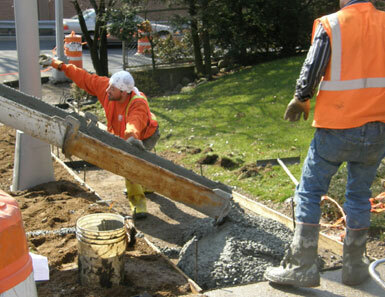 Workers pour cement during sidewalk reconstruction. Corner Treatment—The two slope lines meeting at the intersection of the two building lines must drop from a common point at the building corner toward their respective curbs at a rate within the limits prescribed in the Highway Rules. If this is not possible, sketches or drawings must be submitted, in duplicate, showing the proposed method of treatment to NYC DOT for approval. Pedestrian Ramps—When a corner is constructed, reconstructed or repaired, pedestrian ramps must be installed in accordance with NYC DOT Standard Highway Specifications found and in accordance with the most recent revision of Drawing H-1011 from the NYC DOT's Standard Details of Construction. Adjoining Existing and New Sidewalks—Junctions and transitions between new and existing sidewalks must conform to specifications. NYC DOT's HIQA unit inspects work sites for compliance with Title 19 of the NYC Administrative Code, NYC DOT Rules and Regulations, NYC DOT specifications and NYC DOT permit stipulations. HIQA performs inspections during active construction through its completion and up to the end of the Guarantee Period. HIQA may also inspect emergency street openings/excavations and utility access cover openings. Corrective Action Requests (CARs) are issued to address conditions such as inadequate street restorations, missing or cracked street hardware or street cave-ins. Any corrective action required by the CAR must be performed within 30 days of the issuance of the CAR. For conditions that need immediate attention from the permittee, NYC DOT may issue Priority CARs [AKA Notices of Immediate Corrective Action (NICAs)]. Further information on responding to CARs may be found in the Highway Rules, Section 2-02(d). Notices of Violation (NOVs)/Summonses are issued when there is a violation of laws, rules, regulations, specifications, or stipulations. NOVs carry a monetary fine and place the matter under the jurisdiction of the New York City Environmental Control Board (ECB). Further information on responding to ECB violations may be found on the ECB website. Orders, given orally or in writing, may be issued by the Commissioner to cease and desist work or to perform remedial action. Failure to comply with an order issued by the Commissioner may result in criminal or civil penalties. Further information on responding to Orders may be found in the Highway Rules, Section 2-02(e). Private property owners are responsible for installing, repairing and maintaining sidewalks abutting their properties. NYC DOT inspects sidewalks for defects and when a defect is identified, a Sidewalk Violation is issued to the property owner and a copy is submitted to the County Clerk's office. There is no fine associated with a Sidewalk Violation. The violation provides a property owner 45 days to make repairs (see the Sidewalk Repairs section above for further details). If repairs have not been made within the 45-day period, the City may make the repairs and bill the property owner for the cost of the repairs. Private homeowners applying for Sidewalk Repair Permits who will be making the repairs themselves may apply for permits by mail. If a contractor is being used, the contractor must be registered with NYC DOT and must take out the permit. After repairs are complete, the property owner can contact 311 to schedule a Sidewalk Violation Dismissal. A dismissal inspection is always required to close out a violation. A Sidewalk Violation will be removed if the work has been satisfactorily completed. View more information on how to respond to Sidewalk Violations.